Inner Traditions, Rochester, Vermont, 2005. Translated from the French by Kenneth Hurry. 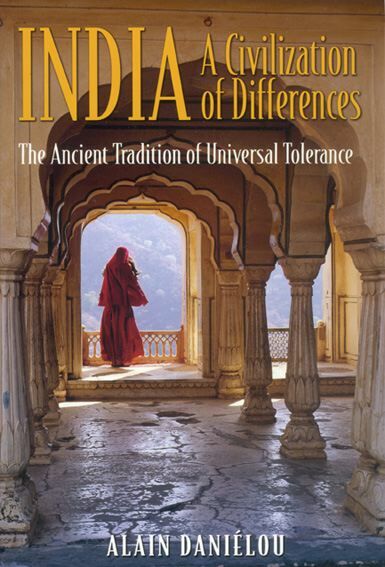 In India : A Civilization of Differences Alain Daniélou builds a bold and cogent defense of the Hindu caste system, viewing it not as racist inequality but as a natural ordering of diversity. Instead of being a hierarchy with some who are privileged and others who are despised, it is an organizing principle of a society wherein differences are embraced rather than ignored. Daniélou argues the point that negative stereotypes about the inequality of Indian society were invented by Westerners to justify the goals of colonialism. In classical India, social ethics are based on each individual’s functional role in society. These ethics vary according to caste in order to maximize the individual’s effectiveness in the social context. In the caste system it is up to the individual to achieve perfection in the state to which he or she has been born, since to a certain extent that state also forms part of a person’s nature. All people must accomplish their individual spiritual destinies while as members of a particular social group, ensuring the continuity of the group and collaborating in creating a favourable framework for all human life – thereby fulfilling the group’s collective destiny. The notion of transmigration provides an equalizing effect on this prescribed system in that today’s prince may be reborn as a woodcutter and the Brahman as a shoemaker. Daniélou thoroughly explores this seldom-heard side of the caste debate and argues effectively in its favor. This rare collection of the late author’s writings contains several never-before-published articles and offers an in-depth look at the structure of Indian society before and after Western colonialism.